Now with 20% more crucifix-masturbation. The Exorcist is a 1973 American horror film directed by William Friedkin, adapted from the 1971 novel of the same name by William Peter Blatty and based on the exorcism case of Robbie Mannheim. It is one of the most successful and acclaimed films of the horror genre, and is often called "the scariest movie of all time". , however those few who survived the filming have been dismissive of such claims. The film deals with the demonic possession of a young girl (played by former child actor, now dead actor, Linda Blair) and the attempts of two priests - played by the late Max Von Sydow and Jason Miller (deceased) - to cure her. It also includes a subplot dramatising the younger priest's struggle to reconcile his faith with his scientific cynicism, although this plotline was ultimately left incomplete due to the screenwriter suffering a tragic and unexpected stroke which left him vegetablised and unable to finish the script. Doctors couldn't explain why a scary face kept being superimposed over Regan's. 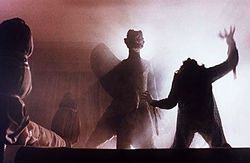 At an archaeological dig in Al-hadar, archaeologist and priest Father Merrin (Max von Sydow) discovers a statue of the demon Pazuzu. The local Arabs panic, believing that the Father has released some kind of evil spirit. These locals were not hired extras, but the film-makers thought they did such a good job of looking terrified that they included the footage anyway; completely ignoring the locals' warnings that a great evil had been unleashed. Later that day, a boom-mic operator is killed by an exploding camel. Meanwhile, in Washington, a 12-year old girl called Regan is suffering violent episodes such as seizures, exhibitions of great strength, levitation, and suddenly being substituted for an older body-double during dangerous scenes. Her concerned mother takes her to every doctor in town, but none can offer a diagnosis other than the onset of puberty. Even the psychiatrist draws a blank. All the while Regan's symptoms get worse. She begins cursing and blaspheming in a scary demonic voice, vigorously masturbating and listening to rock 'n' roll music in her bedroom. "This is like no puberty I've ever seen!" exclaims her mother. When all medical explanations are exhausted, a doctor recommends an exorcism, suggesting that if Regan's symptoms are a psychosomatic result of a belief in demonic possession, then perhaps an exorcism would have the effect of ending them. After quietly backing away from the doctor in fear, Regan's mother goes to consult the young cynical priest, Father Karras. Later that day, a boom-mic operator is killed by an exploding doctor. Father Karras, who is a priest and a psychiatrist, observes Regan committing more strange acts, including talking backwards, demonstrating acute awareness of his private life and crawling down the stairs like a bizarre crab-woman. Contortionist Linda Hager, who performed the famous spider-walk, did irreparable damage to her spine during the scene and never walked again; because she exploded. Father Merrin, in addition to being a priest and an archaeologist, is also an experienced exorcist, so he is summoned to perform the ritual. As the two priests try to drive the spirit from her, Regan taunts them verbally and physically. The very room quakes and splinters, injuring both the characters and the actors playing them. Concerned about the "curse", the film-makers brought in real-life priests to bless the set, in the hope that it would end the apparently unending streak of bad luck. In the next scene, Merrin and Karras continue with the exorcism, but under the immense strain of the ordeal, Father Merrin suffers a fatal heart attack, as do all of the real-life priests. Next, in a slightly confusing scene, Karras seems to convince the spirit to move into him instead. Then he either leaps or falls out of the window, dying on the steps below; thus possibly ending the ordeal. The number-one cause of death on set was "hit by falling girl". Ellen Burstyn as Chris MacNeil - an actress living in Washington with her only daughter and her only evil possessing spirit. Killed by religious protesters. Max von Sydow as Father Merrin - an old priest moonlighting as an archaeologist who has actual experience of performing exorcisms. Killed during his character's death scene. Now that's method acting. Linda Blair as Regan - a 12 year-old girl who becomes possessed by the demon Pazuzu. Blair returned for the sequel The Heretic and was eventually killed at the box office. Jason Miller as Father Karras - a young priest moonlighting as a psychiatrist who is questioning his faith. Assists Merrin with Regan's exorcism. Cause of death unknown; was found dead with his face frozen in shock, as if he'd seen something terrible, with his pants around his ankles. Mercedes McCambridge as Pazuzu's voice - the voice of the demon. Killed at the wrap party by Linda Blair on one of her famous "bad trips". 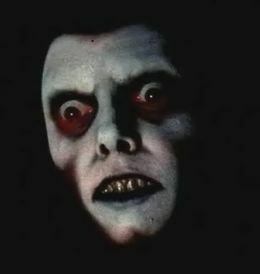 Eileen Dietz as Pazuzu's face - the face of the demon. Killed by an exploding boom-mic operator. In 1971, Author Blatty drew up a contract with Warner Bros., giving them legal rights over his novel The Exorcist, as well as ownership of his mortal soul, although he didn't read the small-print until much later. 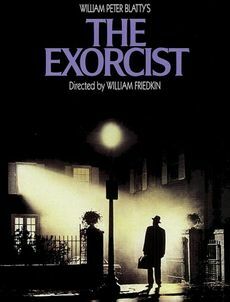 Several directors were considered at first, but Blatty insisted upon Friedkin after seeing his previous film, The French Connection, in a lucid dream when he was sleepwalking in a graveyard. Unsuperstitious to a tee, the two of them rented room 13 at The Hollywood Motel and began work on the first draft of the script. The motel became a popular tourist attraction for horror fans everywhere, who hold regular Halloween parties there; although these have diminished since the explosion. The Exorcist became notable for the continuous accidents and injuries that occurred on set. Popular myth would have us believe that the entire production of the film was cursed for some unknown reason, beginning on the very first day of shooting in the Forbidden City of Al-hadar. However, those involved with the film deny such rumours. Director William Friedkin stated that he never witnessed anything supernatural during the filming, and maintained this right up until his death by exsanguination in 1992. Assistant director Lucifer overseeing the bedroom scenes. Like all great American movies, The Exorcist received mixed reviews upon release. They ranged from "this film is a horror classic" to "this film and everyone who made it should burn in hell". Not since D. W. Griffith's Birth of a Nation had audiences been so simultaneously enamoured and offended by a movie. Many theatres refused to show it, although this wasn't so much due to the controversy as the strange tendency of cinemas burning down during screenings of the film. Although many of the professional reviews were positive, religious people and Christians in general considered the film to be highly blasphemous. Naturally there is nothing more blasphemous to Christians than a story about an innocent girl who is saved from Lucifer by two of their own priests.
. To this day its very name inspires terror throughout the halls of the boom-mic operators' union - which hasn't exploded...yet. ↑ Friedkin, W. (1980) Friedkin on Friedkin. This page was last edited on 29 August 2012, at 02:37.